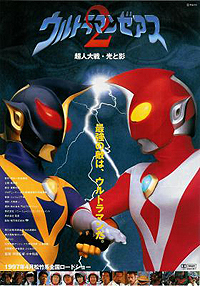 Urutoraman Zeasu 2 (1997) - Sci-fi-central.com. Japan  1997  66m   Directed by: Kazuya Konaka.  Starring: Takaaki Ishibashi, Ichirôta Miyakawa, Go Hideki, Susumu Kurobe, Andy Hug, Masanari Nihei, Kôji Moritsugu, Yuriko Hishimi, Nobuaki Kakuda..
After receiving a message from his father, Zearth decides to train and become powerful enough to face an evil android.